You can start a business at any point in your life. I have seen 50 and 60 year old entrepreneurs. However, the most common regret among these individuals is their desire to go back in time and have started when they were young adults and in college. Why you ask? Here are 6 reasons of why you should start your business in college. Free Labor & Resources 😩 You have an amazing and cheap talent pool to poach from. Your peers on campus, are studying all the fields that you want to fill your company with, and they need and want experience to pad their resume. I started my first business in college, an educational consulting business after winning over $100,000 in scholarships. My business partner was my friend JT, who was actually the very first person that I met on campus. I had free office space on campus, mentors, professors eagerly interested in helping me and opening up doors. Most college campuses have co-working spaces, pitch competitions, and innovation hubs. You have no excuses especially since your tuition pays for most of this stuff. You Don’t Have a Family: Most likely when you are in college you don’t have children or a spouse yet. Children are awesome and fun, but they also complicate things a bit. Children are one of the biggest reasons that people don’t want to go achieve their dreams. They are afraid of not spending enough time with their children, or being able to provide for their families. If you are on your own then you can be selfish. You don’t have to think about how you are going to support other people. 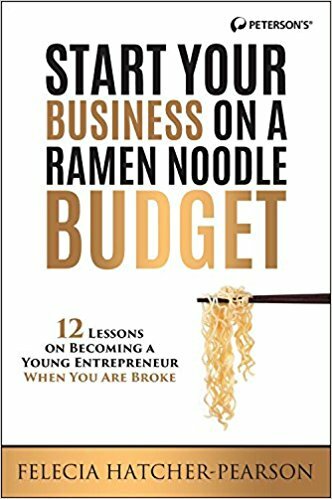 You can jump off the cliff and you can embrace the Ramen noodle budget! The Ramen Noodle budget is very difficult when you have children with very different needs to think about. Hopefully if you started in college you would be able to begin to build your brand before your children complicate life a little. You have Your Whole Life Ahead of You: The most obvious reason is the fact that you have your entire life to build your business and make it successful. You have time to take it to where you know it can go. You are starting at the same time as people are starting their cubicle careers and you have the world and your whole life in front of you. You will be able to build a bigger brand if you start younger. You Don’t Have a Mortgage: One of the best things about being in college is that you don’t have a mortgage payment each month. You probably have college loans, but most of those you don’t even have to pay back until you graduate. Adding a mortgage (and additional home bills) will add to your stress and your lack of desire to risk it all by opening up a business. Flexible Schedule: You may not think you have a flexible schedule while you are in college, but you do. Yes, you have classes and yes you have homework but your time is your own. You don’t have to drop children off at school, you don’t have tons of obligation events, you don’t have a 9-5 job or a spouse who has just as many responsibilities as you. College is the best time to just think about yourself. Why not think about your future! Haven’t Racked up Debt: If you decide to open up a business before you finish college then you might be able to build a brand before you are nose deep in loans and maybe your business can even help you pay for your schooling. You might find that you would rather do your business then become a doctor (which is quite a bit more school and tons more money). No cushy job yet: One of the biggest obstacles that I faced when trying to start my business is that I had a hard time thinking about leaving my job. I really enjoyed my job and I made good money. It was hard to give it all up for just an idea. I lost the job which is why I finally decided to start my business. It is hard for people to leave their comfortable life for something that is unknown. However, when you are in college you haven’t started a career yet. Your whole life is an unknown and you are much more willing to risk. Previous Post What the Heck is your WHY?